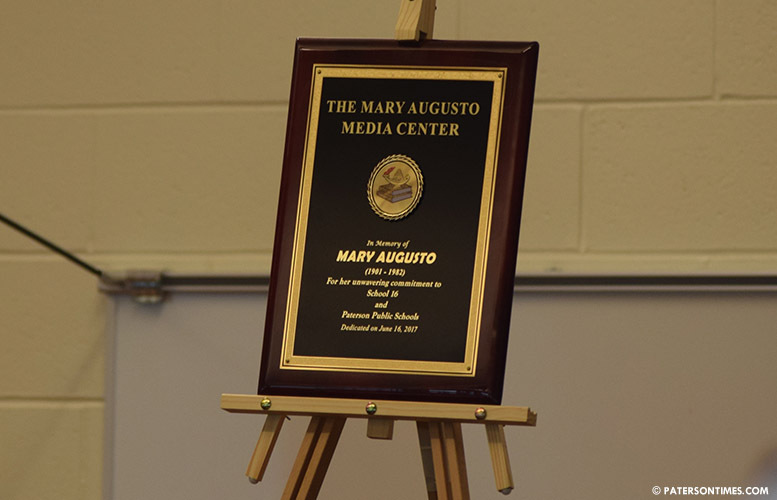 School officials unveiled a plaque on Friday morning dedicating the School 16 media center to Italian-American trailblazer Mary Augusto who founded “The Italian Voice” newspaper and was the first woman to run for mayor in the Silk City. “My mother believed in trying to do good for people,” said Augusto’s daughter Cesairna Augusto Earl. 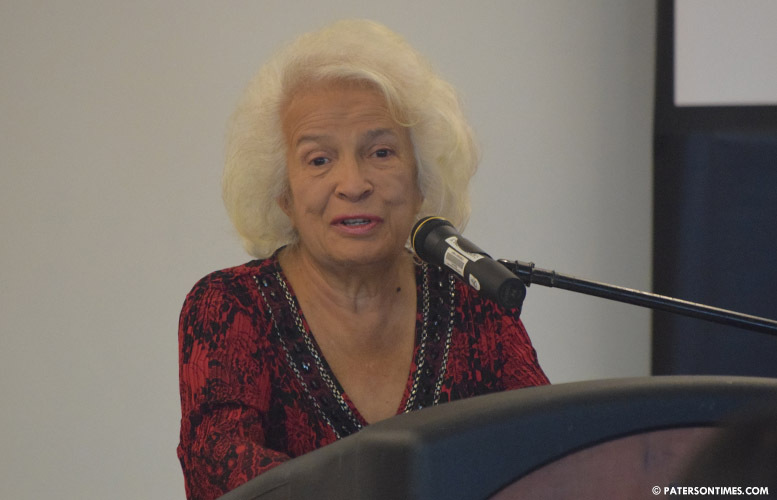 When Augusto learned the Board of Education was planning to close down School 16 in 1946-7 because the building was too expensive to heat in the winter, she sprang to action gathering 200 People’s Park section residents to protest. A painted portrait of Mary Augusto. Augusto’s protest was successful. She suggested eliminating the top floor of the three-floor building to make it cheaper to heat. The top floor was taken offline. “Because of Mary this school did remain open,” said Earl. Without Augusto’s marshalling of neighborhood residents to save the old School 16 there probably would not be a school at that location. Earl lobbied the school district to ensure her mother’s role in the school’s and the city’s history is recognized. Born in 1901 in Nicastro, Calabria, Italy, Augusto came to Paterson through Ellis Island in 1920. The 19th Amendment to the U.S. Constitution extended the franchise to women the same year Augusto arrived in the USA. Her siblings were already in the United States. She joined them at a house in Paterson. 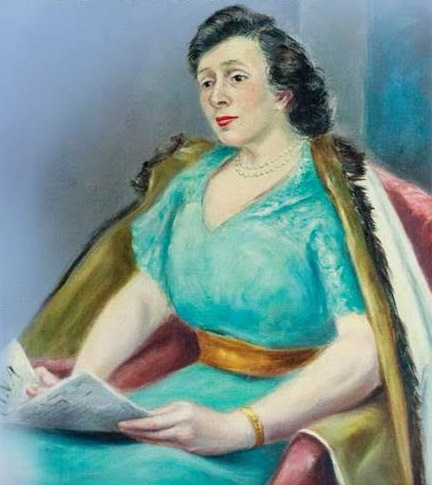 Augusto and her husband later founded the Italian Voice in 1932. The publication continues to put out new issues every Thursday, according Earl. She was also active in the major issues of the day. Some of the big issues she was involved in included railing against the inhumane working conditions in the silk mills. She also came out against political patronage in city government. As a reform candidate, she tossed her hat into the ring for mayor in 1947, becoming the first woman to ever run for mayor in Paterson. Augusto lacked access to party money and lost. She died in 1982. Her life’s successes and failures are chronicled in an article in a book called “Past and Promise: Lives of New Jersey Women.” Earl donated that book to the library. Cesairna Augusto Earl speaking at her mother’s library dedication ceremony. “Mrs. Augusto and her daughter, Mrs. Earl, are shining examples of community advocates. They played active roles in their neighborhoods and in this city. They never gave up,” said school board vice president Chrystal Cleaves. “They should be inspirations for all of you,” she told a library room with two dozen students. She urged the students to get involved in their school and local community. The dedication ceremony was attended by some of Augusto’s grandchildren. There was also longtime city mayor Lawrence “Pat” Kramer. Part of the dedication ceremony included a time capsule to be buried at the school. The time capsule will contain three issues of the Italian Voice, including an issue that featured a story on the new school’s opening. There will also be a certificate that was given to the school by mayor Jose “Joey” Torres at the ribbon cutting ceremony last year. The ribbon from that ceremony will also be inside the time capsule. Other items that will go inside the capsule will be a letter from a longtime former teacher, district’s annual report, quotes from students, and a picture of the class of 2017. A time capsule containing district documents and newspapers from 1890, the year the original school opened, was discovered following demolition of the old School 16 on 22nd Avenue. The district is holding onto tradition by burying a new time capsule at the school. The unveiled plaque will be placed close to the entrance of the School 16 library.